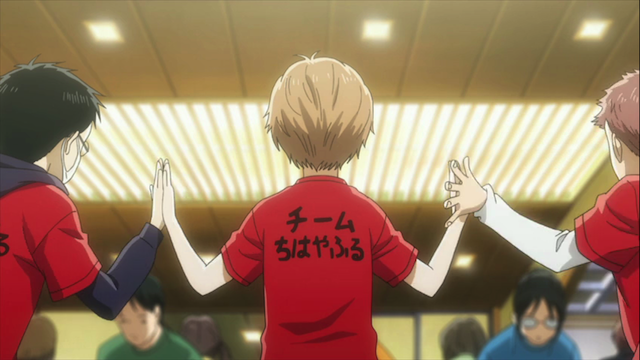 In episode 3, Chihayafuru compresses the rest of the story of the main trio’s grade school friendship. 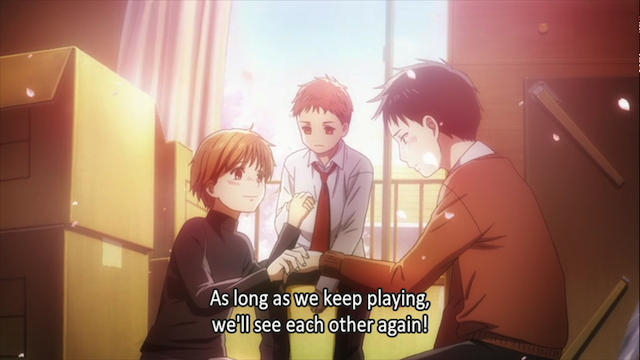 We get to see them grow together through Karuta, and the events that ripped them apart. It is pretty obvious that a lot of content was compressed into this episode, so it feels a bit rushed, but I appreciate what they were trying to do — get us back to the present time with the information we need to appreciate the situation Chihaya finds herself in at the start of high school. Our trio visit a Karuta club, where they have the opportunity to play as a team. 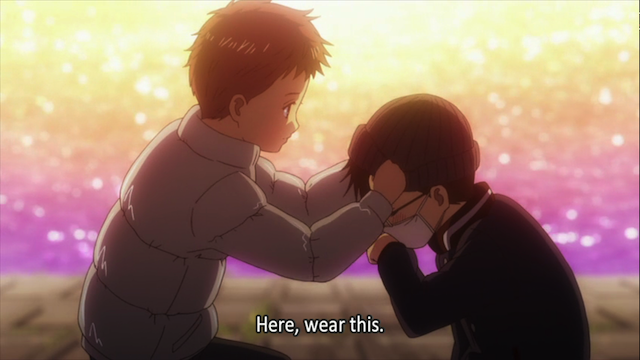 Chihaya's unexpected strength brings out Arata's competitive spirit. The team ends up competing amongst themselves more than against their opponents. We see changes in Chihaya, as she comes to love Karuta, and studies to be good at it. We also see the trio become good friends. 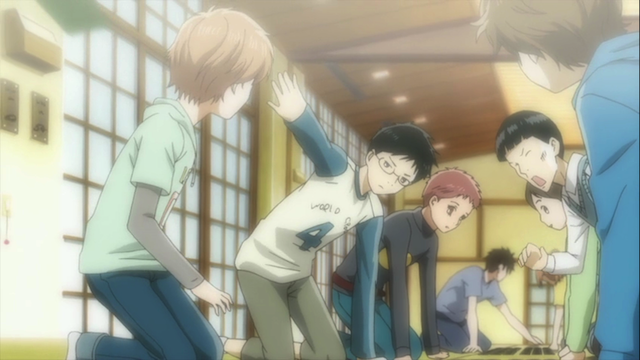 The trio enter a tournament as Team Chihayafuru. The emotional impact of the tournament was greatly diminished by the rushing to wrap up the flashback in this episode. Chihaya’s anguish at learning that both Arata and Taichi would be leaving her is understandable, though, and it underlines the issue raised in the first episode. 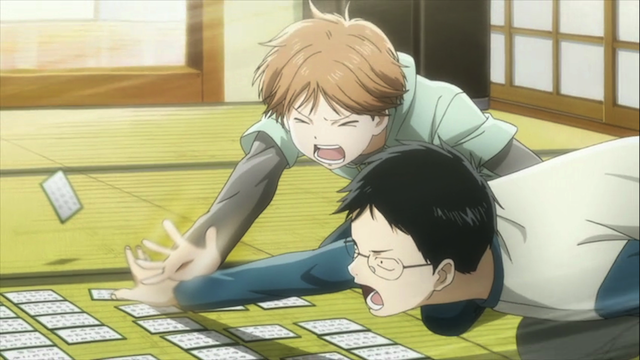 Chihaya wants to play Karuta with teammates, but she is alone. 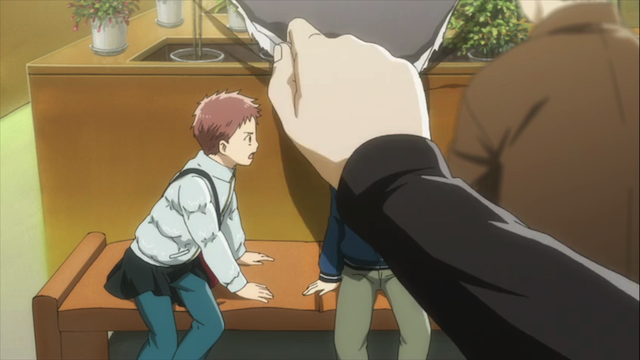 I'm glad they included this moment of Taichi acting out of compassion for Arata. It is easy to understand their rivalry, but this showed that Taichi can actually be a nice guy to someone he earlier bullied. 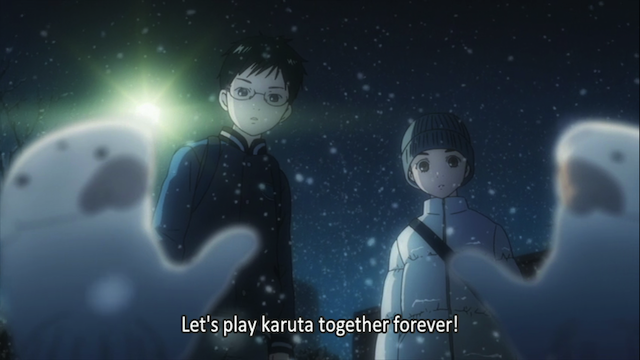 Chihaya's hope that Karuta will bring them together again. A hope that seems to have become a broken dream in the present. As I said, this episode, taken by itself, felt rushed, but I think they did a good job of filling in the rest of the back-story. Now we are well set for the story of Chihaya’s present, where she hopes to create a Karuta club, and also to reconnect with old friends that have been taken from her by circumstance. Unlike you, I thought it was well paced. But then again, I’m focusing more on their friendship then on the Karuta game. Well, as an example, it wasn’t clear to me that the old man gave Chihaya the cards until after she returned them. I watched the episode a second time, and noticed the old guy passing her some cards, but he doesn’t say, “here, use these,” nor does Chihaya say, “thanks”. The scene is really fast, so I missed, or misinterpreted it the first time. Another example is what exactly was happening when Taichi and Arata went back to the Karuta club without Chihaya? Basically I think they packed a lot of stuff into this episode. I’m not bothered by it, though. I think it shows they have a strong vision for what they wanted to accomplish, instead of just adapting the manga at the pace it was originally presented.